In default web search interfaces, you can easily compose a complex query using the optional Advanced Search link. The parameters found in the sections of the page allow you to specify multiple keywords with logical operators, date criteria, document properties, and collection restrictions, without typing search operators or field names. Note: The Advanced Search feature is optional and must be enabled by your Coveo administrator (see Activating Search Interface Options With the .NET Interface Editor). 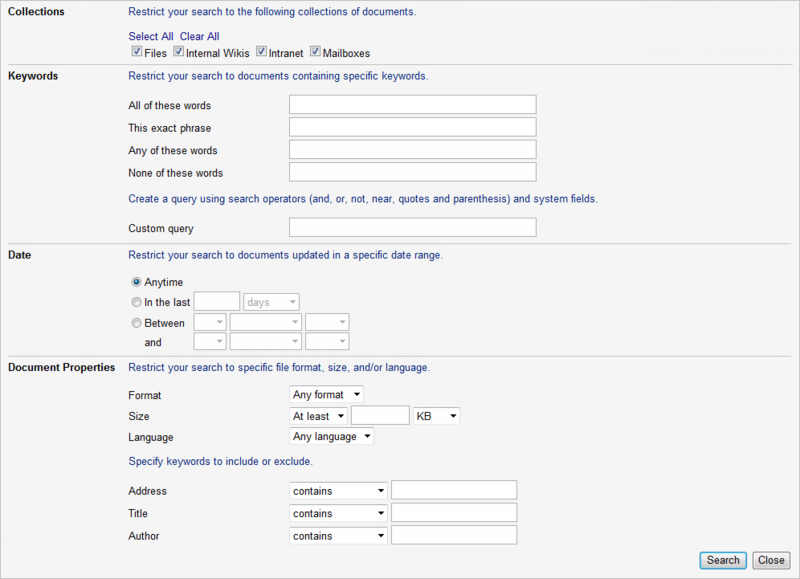 With the default web search interface, click Advanced Search appearing below the search box. With the Desktop Searchbar, on the Do More menu, click Advanced Search. In the Collections section, compose a query that includes a scope restriction to selected collections (see What Is an Index Collection?). Only the collections selected are searched. In the Keywords section, compose a query that includes keywords and operators. The following table describes the available parameters. The document must contain all terms (words, numbers, etc.) entered in this box. Their order is not important. This parameter is equivalent to using the AND operator between keywords. The document must contain the term sequence or phrase. All terms, as well as their specific order, are important. This parameter is equivalent to using quotation marks " " around the phrase. The document must contain at least one of the terms (words, numbers, etc.) entered in this box. This parameter is equivalent to using the OR operator between keywords. The document must not contain the terms (words, numbers, etc.) entered in this box. This parameter is equivalent to using the NOT operator before keywords. The terms entered in this box are not subject to any implicit operator or field. The Custom query complements the advanced search by allowing to query extra fields where field names or operators must be used. In the Date section, compose a query that includes date fields (see also Narrowing Results By Date). The following table describes the available parameters. Anytime N/A The creation or modification date of a document is not important. In the last n days/months Numeric The document must have been created or modified in the last n days or months. This parameter is equivalent to using the @sysdate field query. Between [StartDate] and [EndDate] Drop-down list selections The document must have been created or modified between the two specified dates. This parameter is equivalent to using the @sysdate field query. In the Document Properties section, compose a query that includes document metadata fields. The following table describes the available parameters. Format Drop-down list selection The document must be of a specific type (Word, Excel, PowerPoint, PDF, Web page, text, or email). This parameter is equivalent to using the @sysfiletype field query. . Size Numeric The document must be smaller than (At most) or larger than (At least) the value (in KB, MB or bytes) entered in this parameter. This parameter is equivalent to using the @syssize field query. Language Drop-down list selection The document must be written in a specific language (see Supported Languages). This parameter is equivalent to using the @syslanguage field query. contains: The document metadata must contain all the terms (words, numbers, etc.) entered in the search box. Their order is not important. does not contain: The document metadata must not contain the terms (words, numbers, etc.) entered in the search box. Equivalent of using the NOT operator preceding a term. Terms in these parameters are not expanded with thesaurus entries. matches: The document metadata must contain the exact, contiguous, and same order terms (words, numbers, etc.) entered in the box. These parameters are equivalent to respectively using the @sysuri, @systitle, and @sysauthor field queries. To start the search, click Search at the bottom of the page, or click the search button next to the search box. Tip: Click the Link link to see the text of the complete query that you composed using the Advanced Search page (see Viewing the Extended Underlying Query). To close the page, click Hide Advanced Search below the search box or on the Do More menu.